Entrance hall: with a stone tiled floor. Sitting/Dining room: a light and spacious L-shaped room with a contemporary wood-burning stove with a slate hearth and full height arched window and glazed doors overlooking the private garden. Tastefully furnished by an interior designer with a sitting area and a separate dining area. There are beautiful real leather sofas, coffee table, well-stocked bookshelves, a selection of toys and games, an Apple digital TV with freeview and DVD player. The light and airy dining area overlooks the rear garden and has a painted wooden table with 6 chairs. Kitchen: a high quality cream-painted kitchen with granite work surfaces and a breakfast bar with bar stools. There is a built-in electric oven with halogen hob, slim-line dishwasher, fridge, drinking water tap and microwave. At the other end of the kitchen is a free-standing fridge/freezer. Utility room: a useful warm drying room with a washer/dryer and a sink. There is a door through to the cloakroom. There is the advantage of unlimited free Wifi throughout the barn. The stairs are not steep and lead up to the first floor galleried landing which has feature windows. Bedroom 1: has a feature arched window and lovely open countryside views. There is a superking size bed with bedside tables and lamps and a wardrobe with integral drawers. En-suite shower room: feature arched window and a walk-in shower cubicle, hand basin, WC and a heated towel rail. Bedroom 2: a spacious room with countryside views. There is a superking ziplinked bed (these may be unzipped to make twin beds if required), bedside tables and lamps, and a wardrobe with integral drawers.. Bedroom 3: lovely room at the front of the barn with twin beds and a wardrobe. Bathroom: has a panelled bath with shower mixer taps, hand basin, WC and a heated towel rail. 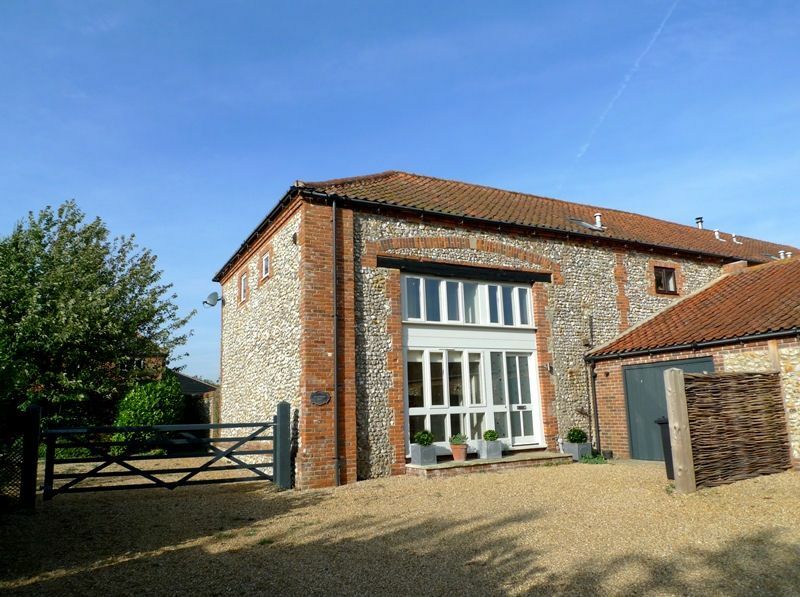 Crowberry Barn is located off a quiet back road and is one of a small select development of Crow Hall Barns. There is plenty of off-street parking at the front and the side of the barn in the large shingled drive area. At the back is an attractive fully enclosed west facing garden with a paved area, outside furniture, lawned area and a variety of shrubs and plants. There is an additional large south-facing side garden (not fully enclosed) which is partly lawned and part-decked, with a trampoline with a safety net (this may be used by guests at their own risk). It takes approximately 25 minutes to walk (or 3 minutes to drive) to Burnham Market's village green. The stunning sandy beaches on the North Norfolk coast are easily reached within 10 minutes drive.